G.O.L.D is a unique web based tool that will transform your approach to organisational development. It is a one stop shop to support the employees learning and helps them to apply and track the impact of new skills. It provides the employer with a suite of tools including a 360 degree system,a performance management system that can be tailored to your in house model, a programme management tool and return on investment reports. ​We deliver a range of CMI Leadership and coaching programmes at levels 3, 5 and 7. All programmes include access to our business improvement system GOLD. Management qualifications can enhance your professional reputation and dramatically improve your career prospects. In a recent survey, over 80% of managers the CMI spoke to said that undertaking a CMI qualification plays a key part in becoming a professional manager. ﻿An assessment of our customers approach to learning and development, which results in a detailed set of recommendations, consultancy support and application of our software GOLD to embed an evidence based model to learning and development. we draw on a range of models and techniques to asses your approach and the tailored report and recommendation has helped many customers to win national training awards. 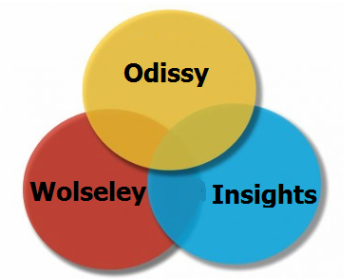 We are delighted to be working in partnership with Insights and Wolseley to support their leadership programmes. We will be responsible for enhancing the learning climate across the organisation and facilitating learning transfer and ROI that is leading the way in their sector. Our consultants will develop a stakeholder accountability plan across the organisation and our unique learning transfer software GOLD will then support managers in demonstrating high levels of application and business impact. Coaching is seen by many as a positive people development initiative, but there are many examples of it generating limited behavioural change or business impact. This is because there are low expectations for improvement and poor follow up strategies in organisations. SAFRAN are aware of these risks and they have commissioned Odissy to ensure they avoid them.. We will manage the coaching sessions but we will tie the sessions into clear business, customer, team and personal goals. We will use GOLD to support the Coachees so they have an efficient cloud based system to report on their achievements. Our ability to align their efforts to high level success factors via GOLD sets us apart from other coaching companies.